This has given me a completely different image of the Marriott. no for Fl. Kidcare funding,no to teacher salary increases. 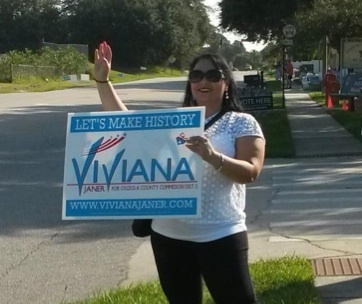 Vivian Janer is a Democratic with Democratic moral values. Mariott taking lessons from guests. Shame on you. Marriott International just posted this statement on their Facebook page. So this has nothing to do with Marriott, just MVW. Facts should be checked before people get mad at the wrong company! Hmm. Jane, can’t find a single Marriott Facebook page that states that. Do you have a link? Marriott Hotels and Resorts Facebook page. They’re responding to the comments. check out the comments in the first post. Attend, young grasshopper, and learn about the wonderous mysteries of corporate reorganizations. The sine qua non of a “spin off” transaction is continuity of ownership and/or continuity of business operations. In other words, parent company put the time share business into a separate legal entity, most likely with a view toward insulating itself from the credit and public relations risks of a business line which are different than the risks of the hotel business (i.e. pissed off unit owners who suddenly realize their vacation week really cant be re-sold). In pretty much all other respects, its: meet the new boss, same as the old boss. Let’s say someone has a bunch of Marriott Rewards points that they suddenly realized they never want to use. Wouldn’t it be nice to have a campaign headquarters in a Marriott? Can we do that? When you intentionally share the same company name to make everyone think you ARE the same company don’t be surprised when it works. Also, since your companies share the same brand name and reputation, it would be in the best interest of all Marriott chains to behave professionally so you do not have to make embarrassing statements like this to distance yourselves from each other. Stupid decision to fire the Democrat, exposing bad management practices within the Marriott family. Get your act together immediately, and stop all of your involvement in politics. People see that for what it is, especially when you so shamelessly endorse the Republican candidate. I phoned Marriot Vacations Worldwide at 407-206-6000, then pressed zero and asked for Ed Kinney, their company spokesman who was quoted in an article I read. I left a polite voicemail, expressing how appalled and disappointed I was at how Viviana Janer was treated, when she was fired for not quitting her candidacy for Osceola County Commission District 2. I’ll call the FBI. I’m sure they’ll get right on it, maybe even even send Lois Lerner. In other words, cry me a river.